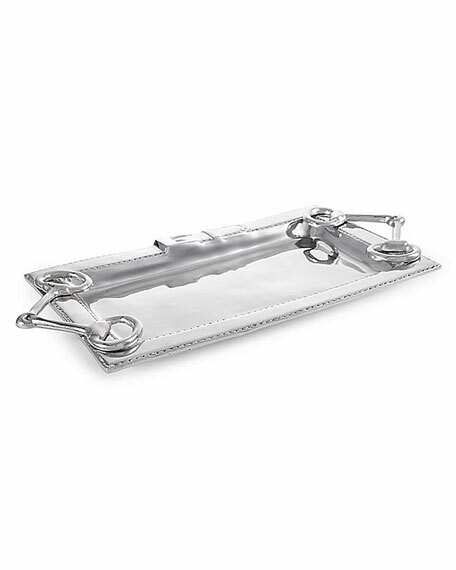 Beatriz Ball's Equestrian large decorative serving platter is elegantly proportioned and outfitted with realistic tack detailing that is sure to delight the horse lover. Its sophisticated equestrian styling adds class to any setting. Ideal for passing around mint juleps at Kentucky Derby parties. Each piece is created by hand, one at a time, by skilled artisans using the ancient technique of sand casting. More than twelve pairs of hands are involved in the creation of each piece. Of heirloom quality, Beatriz Ball metalware will not tarnish or lose its shine. It can be used with confidence to heat, chill and safely serve food. Made of an FDA safe, easy-care, oven and freezer friendly aluminum alloy.